How do I add users to my WordPress sites? 1. 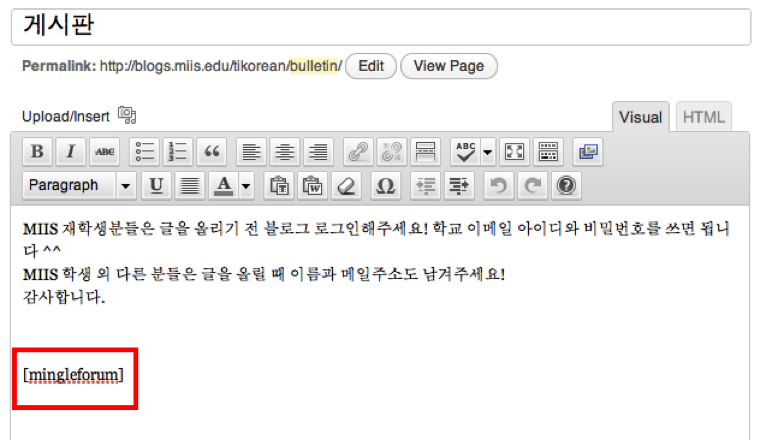 Login to Blogs@MIIS with your username and password. 3. Next type in the last name of the person you would like to add to your site. This person should have a miis.edu username and password, or a verified Middlebury Guest Account. The name and e-mail address will appear in your search if a verified account is available in the active directory. 5. 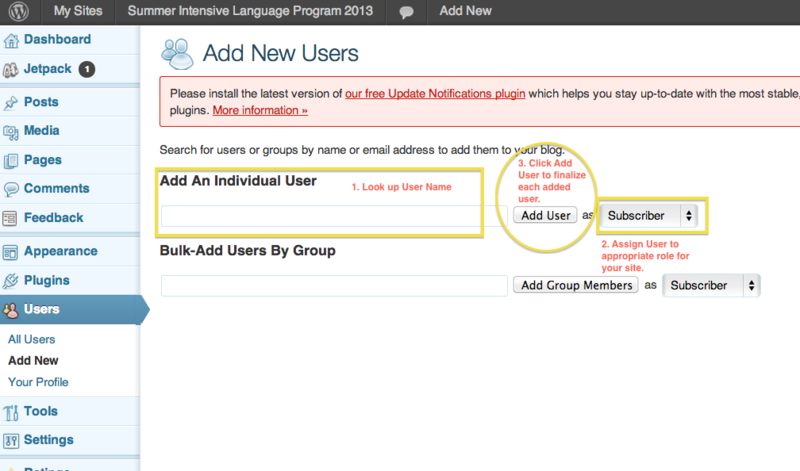 Finally, click “Add User” to complete the process. The users name and e-mail will appear under the search box. 6. Rinse and repeat for each additional user. You can also edit user access and roles in your site dashboard. How do I embed a Middmedia video into a blog post? 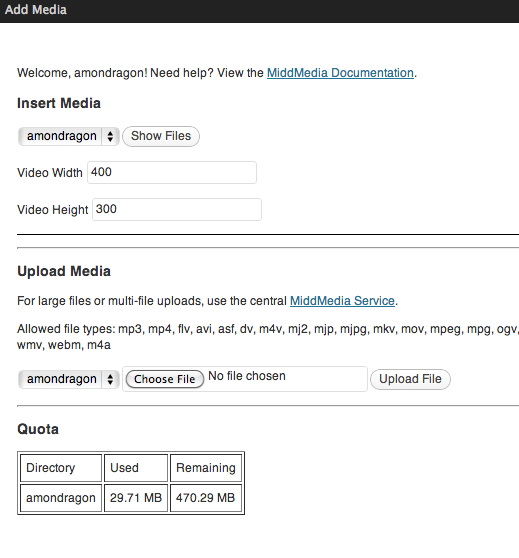 Another option to add videos to your blog post is to upload your video to MiddMedia, a Middlebury media site to save, store and share larger audio and video files. 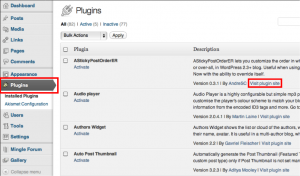 Initially you will need to activate the MiddMedia and Audio Player plugins on your blog. You can skip this step if the plug-in is already activated on your site. Next, Login at MiddMedia using your email username and password. From here you should select the MiddMedia tab. 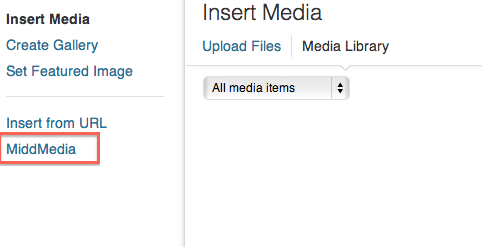 This will open up the Add Media page and allow you to select your media to insert into your blog post. 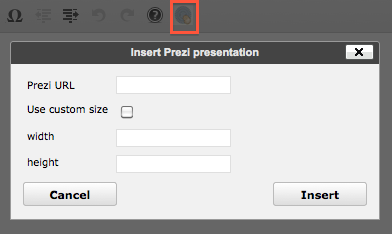 Click “Show Files” to select the video that you want to embed in your post or page. Click “Use” next to the video that you want to embed. 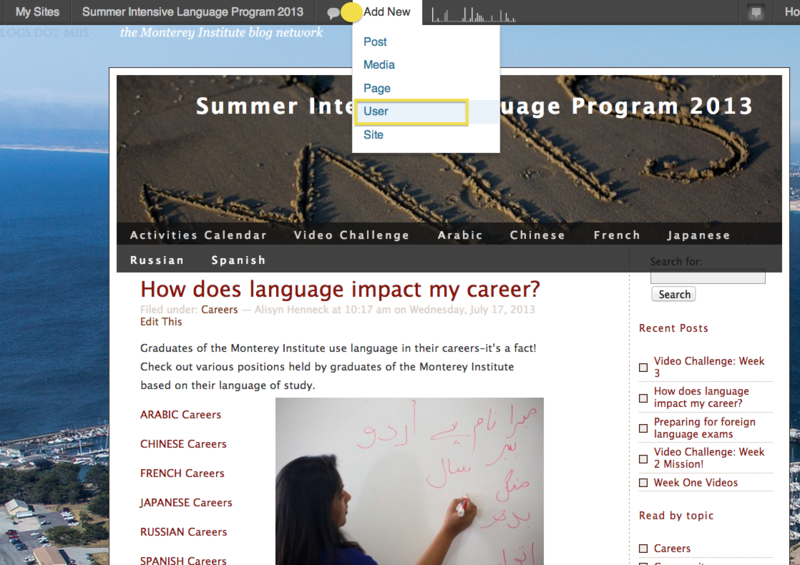 An embed code for the video will appear on your blog post or page. Now preview your blog to ensure your video and/or audio are exactly what you want! How do I make my blog a page on my website? How do I allow my posts to be shared? Sharing blog posts are a great way to share content and draw readers to your blog. In order to do so you will have to install the ShareThis plugin. How do I manage comments on my blog? 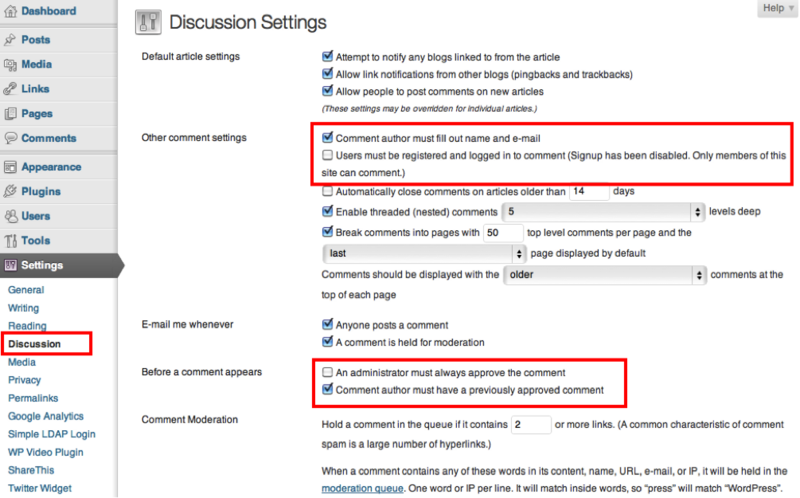 Depending on your settings, you may have to approve comments to get them to display publicly when readers post them without logging in. It is important to manage comments to weed out spam. Check your settings by clicking Settings, and then Discussion. To enable prospective students, alumni, or anyone else to comment on the blog, make sure the box next to “Users must be registered and logged in to comment” is unchecked. Comments will always be held for moderation if the box next to “An administrator must always approve the comment” is checked. Make the appropriate changes and click Save Changes at the bottom of the page. 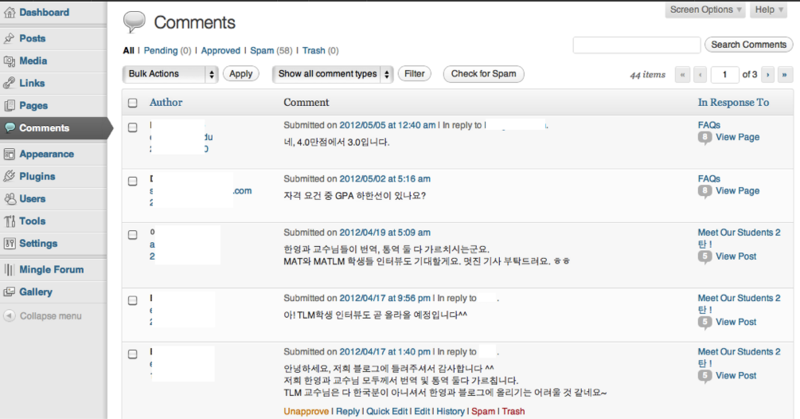 Recent comments will be displayed in the dashboard where you can approve the comments directly. Hover over the comment and click Approve. If the comment is approved, you will see “Unapprove”. Manage comments by clicking Comments on the left menu column. How do I activate and use the Mingle Forum plugin? A forum is a good way to let readers leave general comments or questions that may not be relevant to specific blog posts or pages. 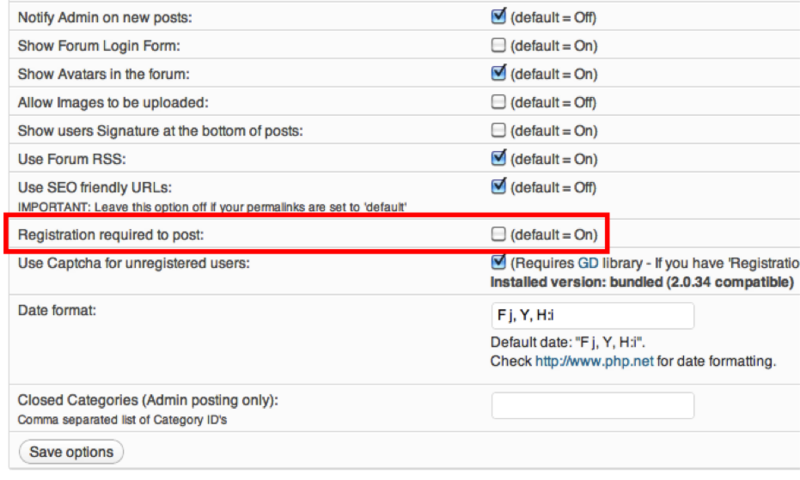 Adding a forum to your blog is easy using the Mingle Forum plugin. To activate this plug-in, go to Plugins in the left menu column, and scroll down to find “Mingle Forum.” Click Activate. 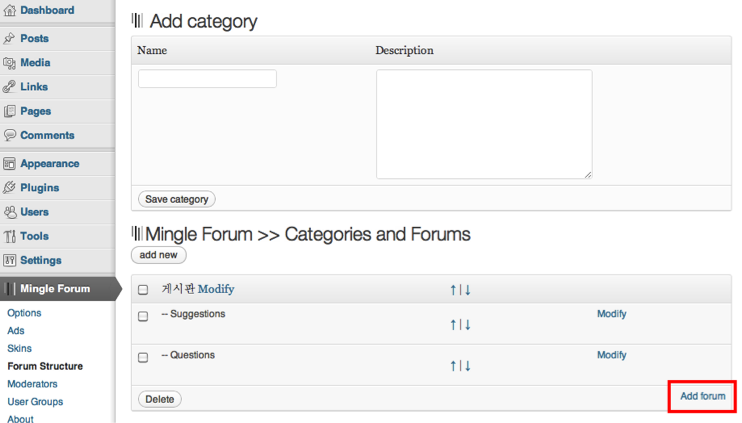 You will then see Mingle Forum in the left menu column. 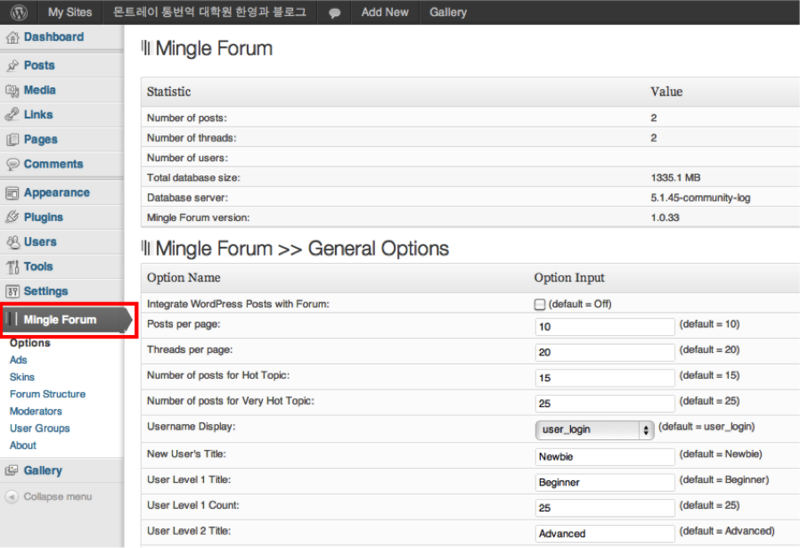 Customize the Mingle Forum settings according to your preferences. If you would like to enable any users who may not have a MIIS username and password to leave comments or questions, make sure to uncheck the box next to “Registration required to post”. Once your settings are saved, click on Forum Structure. The “category” is the overarching topic and “forum” is the sub-topic. Click add new to create a category. Enter the name and a description (optional) and click Save category. 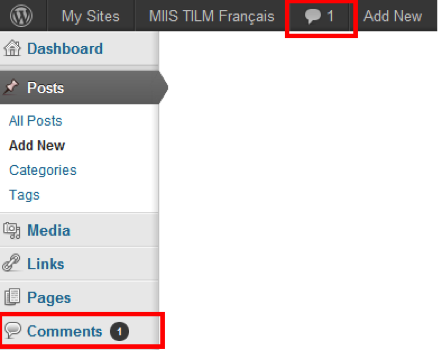 To add a forum as a sub-topic, click Add forum under the appropriate category. Enter the name and description and click Save forum. 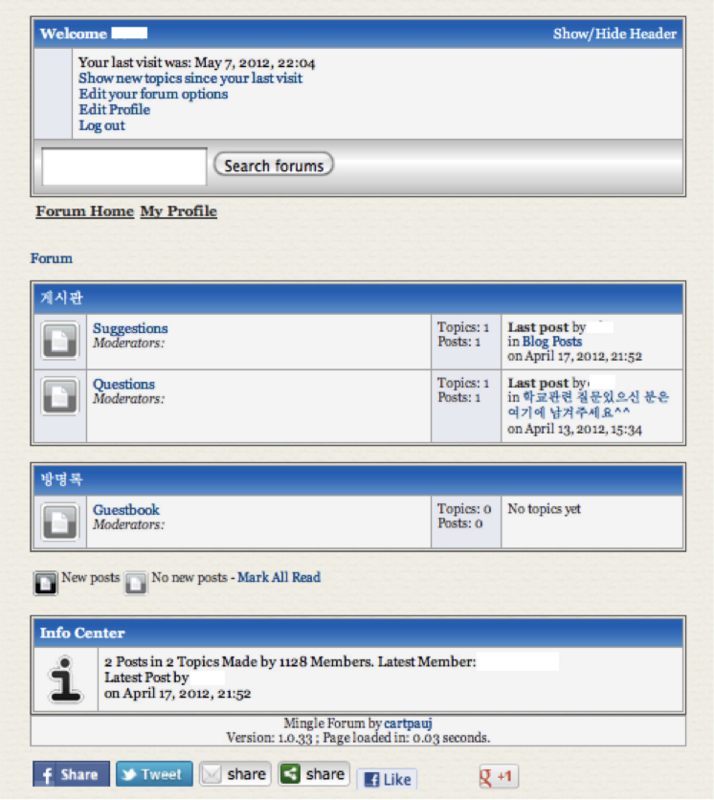 You have now created the forum and customized the settings, but you now need to make the Mingle Forum display on your blog. To do this, create a new page. Type [mingleforum] in the body of the text. 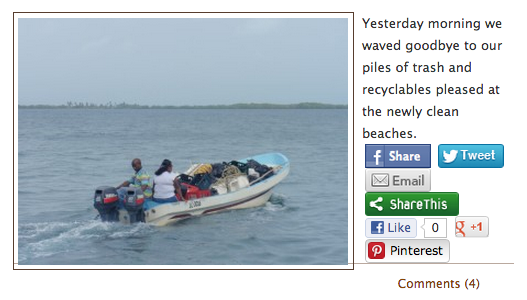 Click Publish. Now that you have created the forum page, go back to the Menu under Appearance and make sure the newly created page is included in the main menu. 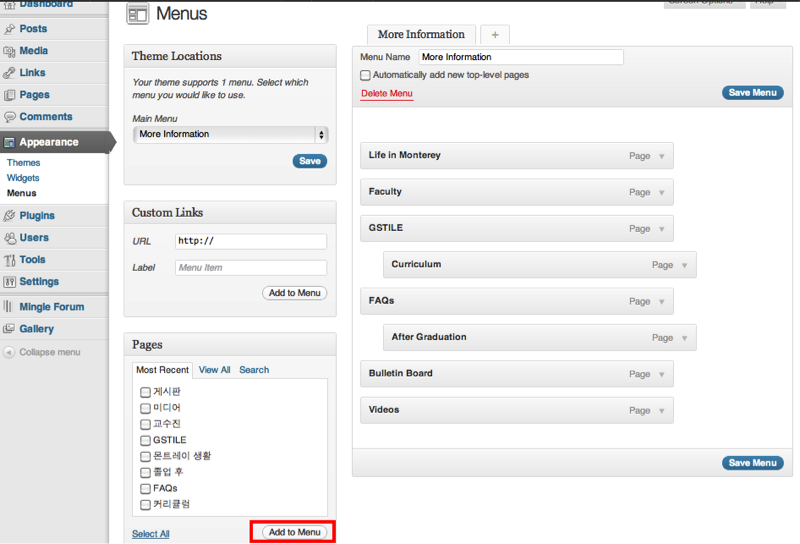 If it isn’t, click the appropriate box for the newly created page and click Add to Menu and then Save Menu. How do I activate a plug-in? 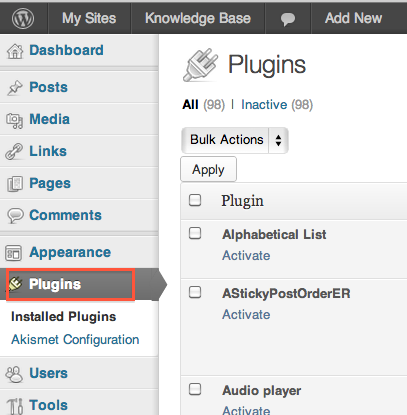 Plugins are tools that can extend the functionality of the blog. 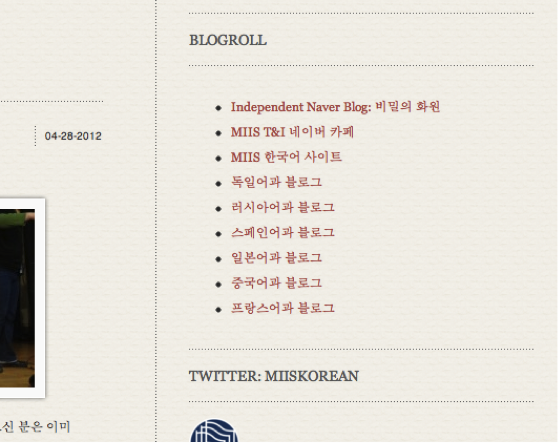 There are various plugins installed in the MIIS blogging community. 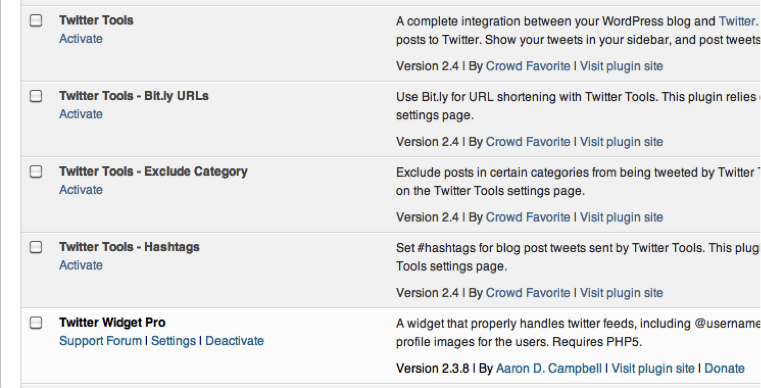 Click Plugins in the left menu column and check the extensive list to see if any would be beneficial for your blog. Click Visit plugin site to check out screenshots and descriptions of the various plugins. If you decide to use a specific plugin, simple click Activate under the name of the plugin. But remember that WordPress runs faster with fewer plugins, so deactivate ones that are not in use. How do I link to other Blogs? 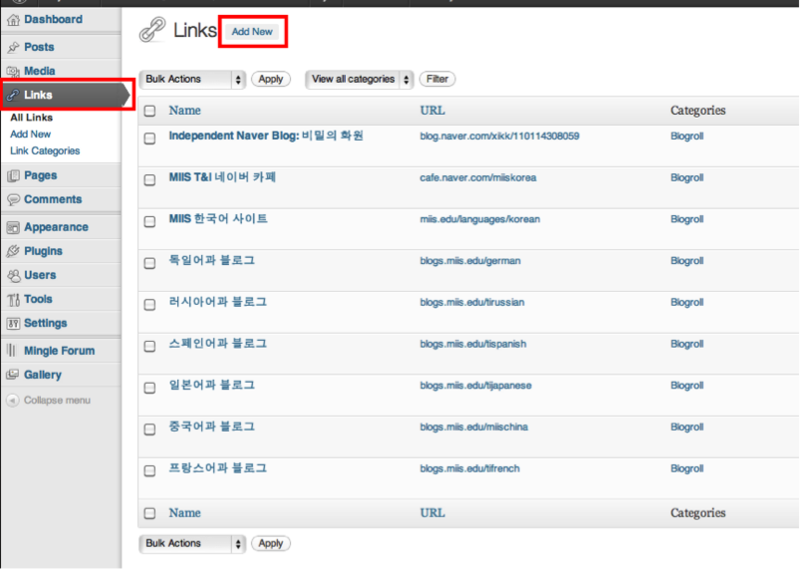 You can have a list of links to other blogs or relevant websites using the Links widget. 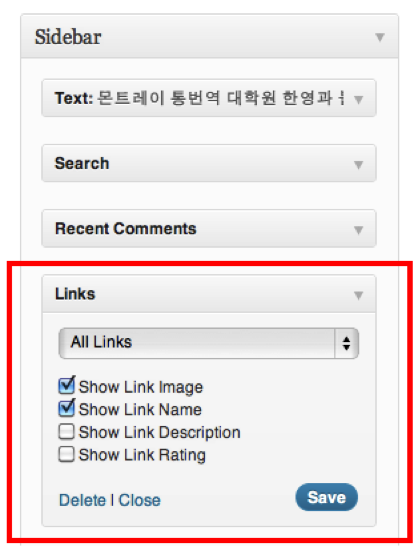 To use the Links widget, you will first need to set them up by clicking on Links in the left menu column. Then click Add New. Enter the name of the link as you want it to show up in the list, the web address, and a description. Then click Add Link. Note: The links will show up in alphabetical order of the “Name” of the link. 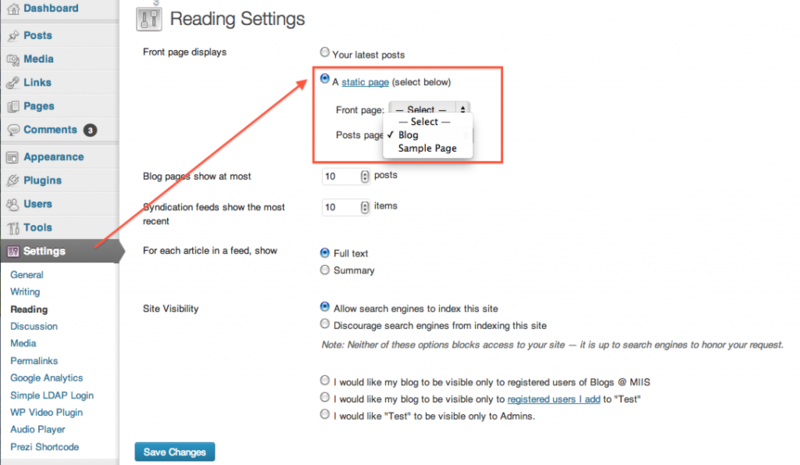 Once you are done setting up your links, go back to the Widgets, under Appearance. 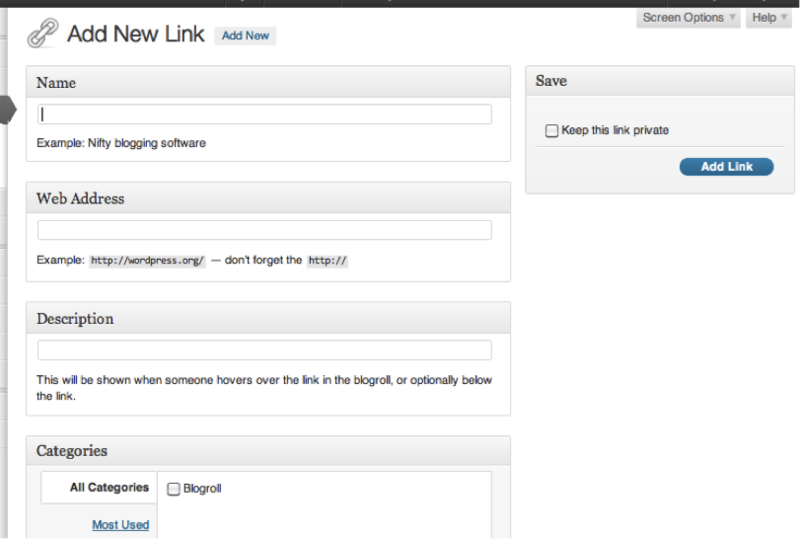 Drag the Links widget into the Sidebar and configure the settings as you please. How do I activate and manage my widgets? The selection of pre-installed widgets depends on the theme you have chosen and the plugins that have been installed. In the left menu column, click Appearance, then Widgets. Then simply drag the widgets you want in your blog into the Sidebar on the right to activate them. There can be more than one Sidebar, depending on the theme. 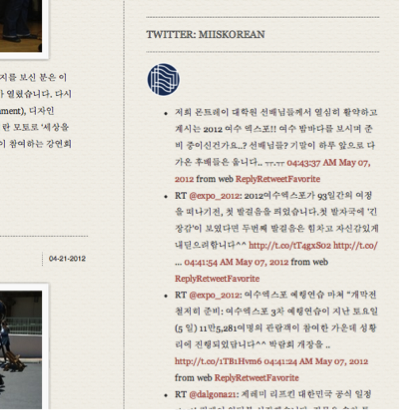 The Korean blog uses the Twitter Widget Pro. To use this widget, drag it into the Sidebar, enter the Twitter username without the “@” and click Save once you finish configuring the settings according to your preferences. 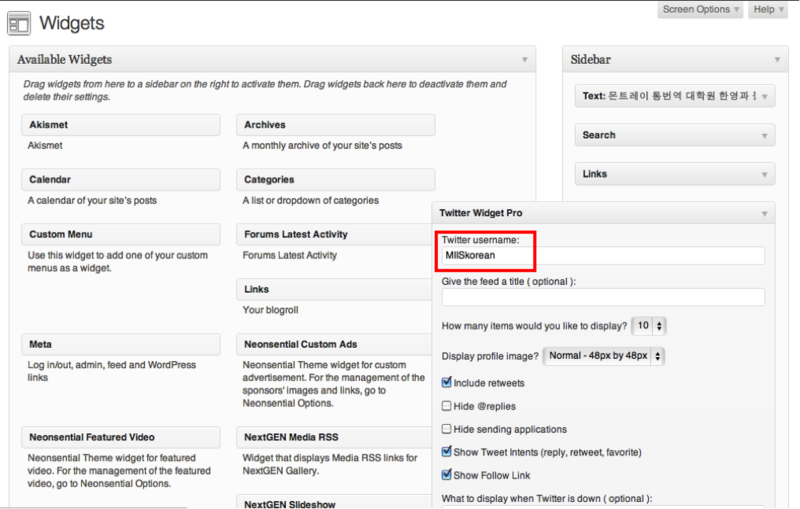 If you can’t find this widget in list of Available Widgets, click Plugins from the left menu column, scroll down to find Twitter Widget Pro and click Activate. It should then be visible in the list of Available Widgets. How do I create Sub-Menus? You can create sub-menus by using the same click and drag technique used to re-order the menu items. Drag and drop the menu items left and right and make sure the sub-menu item is indented.